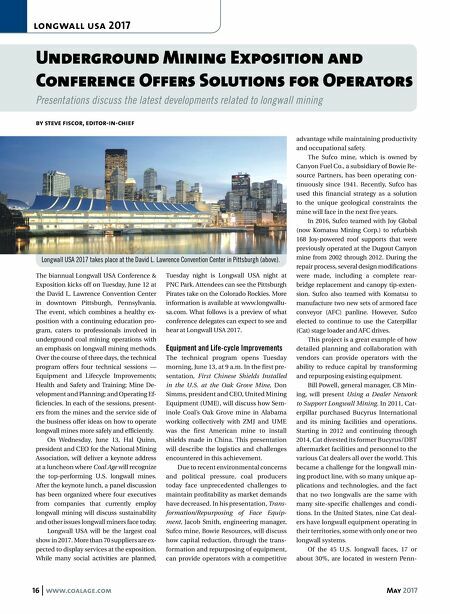 16 www.coalage.com May 2017 longwall usa 2017 Underground Mining Exposition and Conference Offers Solutions for Operators Presentations discuss the latest developments related to longwall mining by steve fiscor, editor-in-chief The biannual Longwall USA Conference & Exposition kicks off on Tuesday, June 12 at the David L. Lawrence Convention Center in downtown Pittsburgh, Pennsylvania. The event, which combines a healthy ex- position with a continuing education pro- gram, caters to professionals involved in underground coal mining operations with an emphasis on longwall mining methods. Over the course of three days, the technical program offers four technical sessions — Equipment and Lifecycle Improvements; Health and Safety and Training; Mine De- velopment and Planning; and Operating Ef- ficiencies. In each of the sessions, present- ers from the mines and the service side of the business offer ideas on how to operate longwall mines more safely and efficiently. On Wednesday, June 13, Hal Quinn, president and CEO for the National Mining Association, will deliver a keynote address at a luncheon where Coal Age will recognize the top-performing U.S. longwall mines. After the keynote lunch, a panel discussion has been organized where four executives from companies that currently employ longwall mining will discuss sustainability and other issues longwall miners face today. 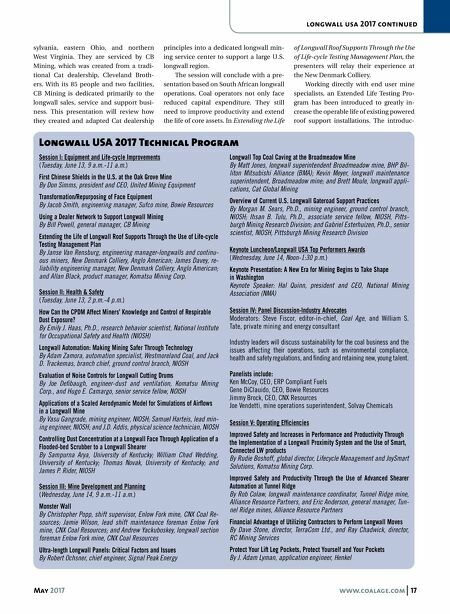 Longwall USA will be the largest coal show in 2017. More than 70 suppliers are ex- pected to display services at the exposition. While many social activities are planned, Tuesday night is Longwall USA night at PNC Park. Attendees can see the Pittsburgh Pirates take on the Colorado Rockies. More information is available at www.longwallu- sa.com. What follows is a preview of what conference delegates can expect to see and hear at Longwall USA 2017. Equipment and Life-cycle Improvements The technical program opens Tuesday morning, June 13, at 9 a.m. In the first pre- sentation, First Chinese Shields Installed in the U.S. at the Oak Grove Mine, Don Simms, president and CEO, United Mining Equipment (UME), will discuss how Sem- inole Coal's Oak Grove mine in Alabama working collectively with ZMJ and UME was the first American mine to install shields made in China. This presentation will describe the logistics and challenges encountered in this achievement. Due to recent environmental concerns and political pressure, coal producers today face unprecedented challenges to maintain profitability as market demands have decreased. In his presentation, Trans- formation/Repurposing of Face Equip- ment, Jacob Smith, engineering manager, Sufco mine, Bowie Resources, will discuss how capital reduction, through the trans- formation and repurposing of equipment, can provide operators with a competitive advantage while maintaining productivity and occupational safety. The Sufco mine, which is owned by Canyon Fuel Co., a subsidiary of Bowie Re- source Partners, has been operating con- tinuously since 1941. Recently, Sufco has used this financial strategy as a solution to the unique geological constraints the mine will face in the next five years. In 2016, Sufco teamed with Joy Global (now Komatsu Mining Corp.) to refurbish 168 Joy-powered roof supports that were previously operated at the Dugout Canyon mine from 2002 through 2012. During the repair process, several design modifications were made, including a complete rear- bridge replacement and canopy tip-exten- sion. Sufco also teamed with Komatsu to manufacture two new sets of armored face conveyor (AFC) panline. However, Sufco elected to continue to use the Caterpillar (Cat) stage loader and AFC drives. This project is a great example of how detailed planning and collaboration with vendors can provide operators with the ability to reduce capital by transforming and repurposing existing equipment. Bill Powell, general manager, CB Min- ing, will present Using a Dealer Network to Support Longwall Mining. In 2011, Cat- erpillar purchased Bucyrus International and its mining facilities and operations. Starting in 2012 and continuing through 2014, Cat divested its former Bucyrus/DBT aftermarket facilities and personnel to the various Cat dealers all over the world. This became a challenge for the longwall min- ing product line, with so many unique ap- plications and technologies, and the fact that no two longwalls are the same with many site-specific challenges and condi- tions. In the United States, nine Cat deal- ers have longwall equipment operating in their territories, some with only one or two longwall systems. Of the 45 U.S. longwall faces, 17 or about 30%, are located in western Penn- Longwall USA 2017 takes place at the David L. Lawrence Convention Center in Pittsburgh (above).